What Are The Benefits Of Bathroom Furniture? Nightmare! Bathroom Furniture Is Definitely Needed Here! Life today seems to be so stressful, balancing work and family life. You want to come home to a bathroom that can be your own little oasis of relaxation, where the days chores or worries can drift away like water down the plug hole. To get that spa like feeling you need remove clutter and this is where bathroom furniture comes into it’s own! By installing bathroom furniture every available bit of space can be used effectively. Ensuring you have a large amount of storage, whilst still giving the illusion of space. 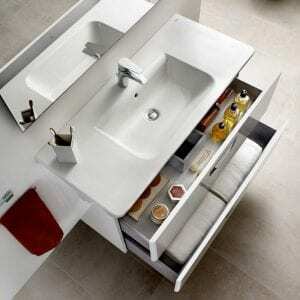 This Roca unit has a top drawer which fits around the basin waste – neat idea! 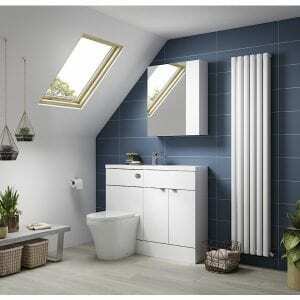 Vanity units and cabinets can hide unsightly pipework or uneven walls. A home for everything, no errant toilet rolls, toothpaste tubes, cleaning materials and the like! The addition of bathroom furniture will take care of this problem. Fitted units will provide a clean, co-ordinated and fuss free look especially if you choose carefully and go for something not too way out, that way it will still look modern in years to come. Bring light and space into your bathroom with White high gloss bathroom furniture. As well as being functional, white gloss furniture will reflect the light making the smallest bathroom appear larger. Of course if you love texture and colour you can select from a range of styles and finishes. Wall hung furniture and fixtures are also brilliant for giving the illusion of space to a small bathroom. Wood effect cabinets will provide a feeling of warmth and softness to the bathroom. You will save time in the mornings as no time is wasted looking for things! 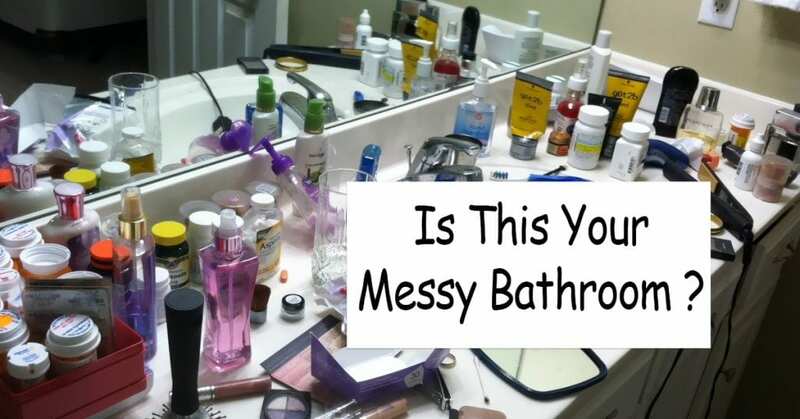 Enjoy Bathing In Your clutter Free Bathroom! Are Air Conditioners Worth The Money? How Easy Is It To Replace An Electric Shower? How To Find The Right Plumber Without Going Round The Bend! Fires – Not Just For Indoors!